It's tough enough to pick highlights. Tougher to rank the first few. It's well nigh impossible to assign anything but an arbitrary number to the several that follow thereafter. So I'm not going to try. At least not this year. Instead, here are several of the Saratoga Highlights-2012 that I'll simply label as special or personal or just plain great favorites. The then-5 year old gelding did it on the turf this time, with a dominating 5 length win. Trained by Charles Lopresti and ridden by Johnny Velasquez, Dan has won big on synthetic, on dirt, and on the turf. 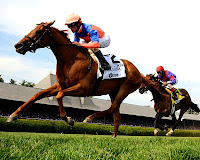 In 2012, he won 5 out of 6, set record times at Keeneland and Santa Anita--including his victory in the Breeders' Cup mile--and proved in the Fourstardave that Saratoga was no graveyard for this champion. And speaking of champions, he joined the company of Secretariat and a very few others to win 3 championship awards in a single year. Earlier this month, he won the Eclipse Awards for Horse of the Year, Older Male, and Male Turf Horse. It was great to see him at the Spa. 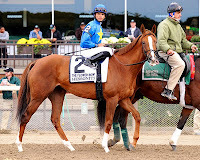 Trained by local favorite Chad Brown and ridden by Saratoga's leading jockey, Ramon Dominguez, the then-5 year old French bred mare set the track record for 1 and 1/1/16th mile on the inner turf. Zagora raced 8 times in 2012. 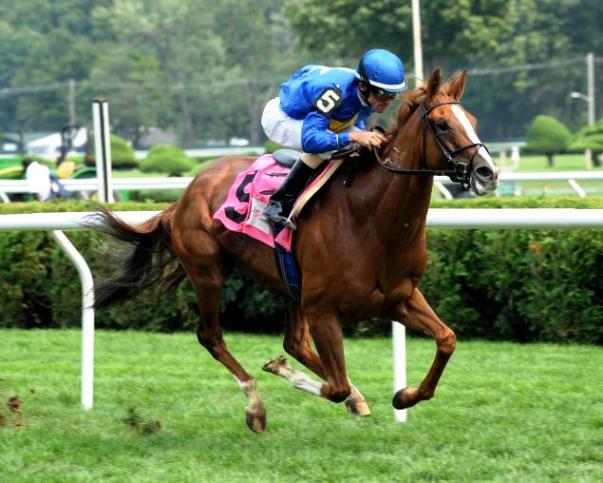 She won 5, including the Breeders' Cup Filly and Mare Turf at Santa Anita in November. She ran twice at Saratoga. 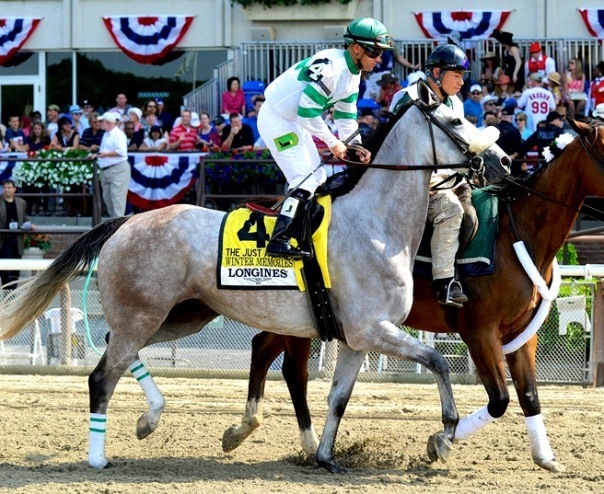 She came in 3rd in the Diana (see below), but rebounded for that record shattering performance in the Ballston Spa. At the Eclipse Awards, she was deservedly crowned the Female Turf Champion. 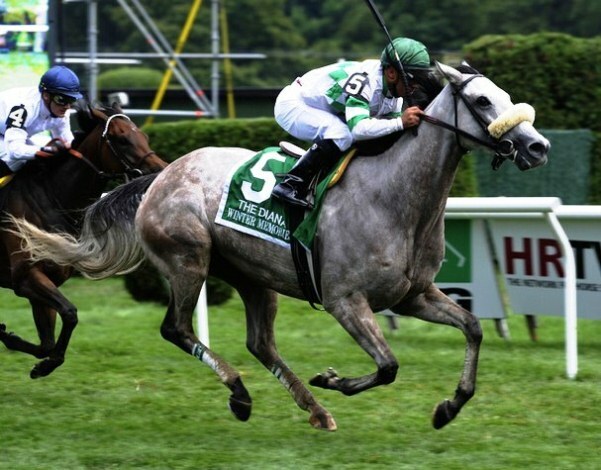 The stunningly gorgeous gray mare rebounded from a 2nd place finish in Belmont's 1 mile Just a Game Stakes several weeks earlier. 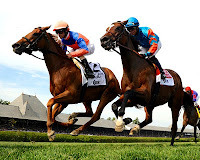 She beat the winner of that race, Tapitsfly, as well as Zagora (see above), in the 1 and 1/8th mile Diana. 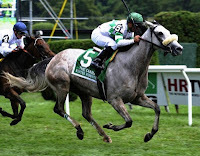 The then 4-year old daughter of El Prado and Memories of Silver (who herself won the Diana in 1998) is hugely popular with the fans at Saratoga (including me--see last year's #6 Highlight: WM's victory in the Lake George). They (we) cheered wildly as she accelerated at the top of the stretch and crossed the finish line with a 1 and 1/2 length lead. As I've said before, my view is that the Woodward is Saratoga's top race. In 2012, it was another great one. Rule took the lead, followed by speedster Trickmeister, with Mucho Macho Man, Stay Thirsty, and Cease taking up the rear. To Honor and Serve held back in 3rd. 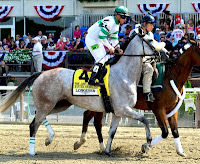 Mucho Macho Man came charging after the leader for a one of those adrenaline pumping duels to the finish. TH&S held on for the victory by a bare neck after the 1 and 1/8th mile distance. 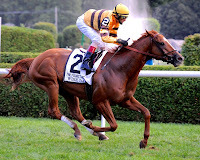 The then-4 year old son of Bernadini, trained by Bill Mott and ridden by Johnny V., was rebounding from 2 consecutive losses. Immediately prior to that, however, To Honor and Serve had won the Cigar Mile at Aqueduct and the Westchester at Belmont. 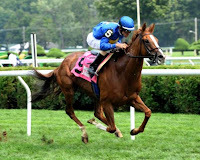 The 2011 New York Female Turf Champion had won the 1 mile Irish Linnet a few weeks earlier at Saratoga by 4 lengths. 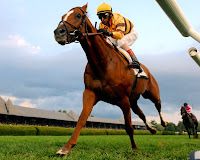 Hessonite, the then-4 year old daughter of Freud, was facing Gitchee Goomie, who had won the 1 and 1/16th mile Yaddo the year before--and had just won 3 in a row. The 2 had met 4 times before. The 2 immediately previous times in 2012, at Parx and Belmont, GG won, Hessonite was runner up. But the tables turned in the Yaddo. And it began a 3-race stretch in which Hessonite would show her dominance. 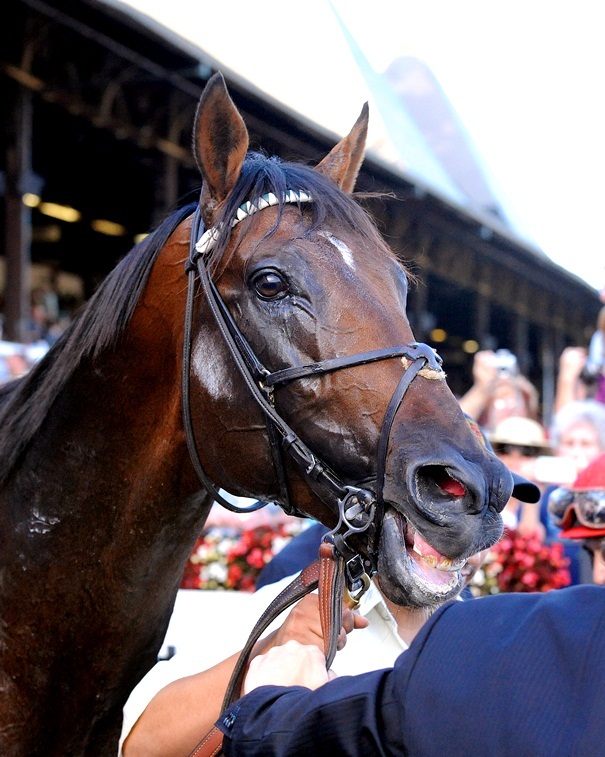 So in 3 weeks, Saratoga saw one of New York's favorite girls win 2 in a row. 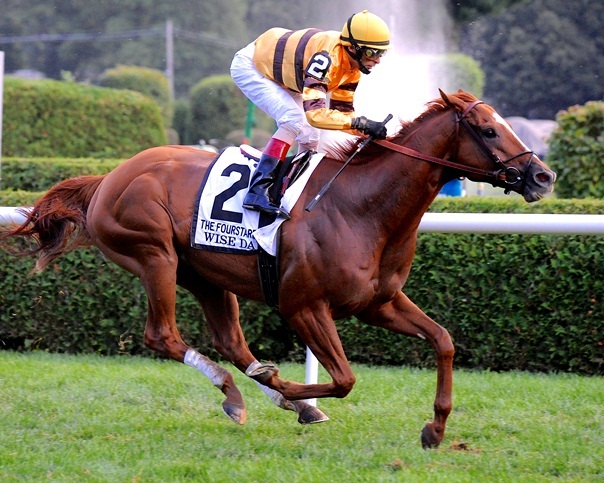 Not surprisingly--despite a subsequently poor performance in the Flower Bowl, but followed by a victorious rebound in the Ticonderoga, both at Belmont--Hessonite was just nominated by NYTB for 2012 Older Female and Turf Female. Congrats to her, Ramon, and trainer David Donk. 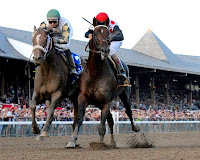 Next up, some "crazy wins" or "stunners" in the penultimate (always liked the on-the-way-to-certain-finality sound of that word) post in the Saratoga Highlights-2012 series.